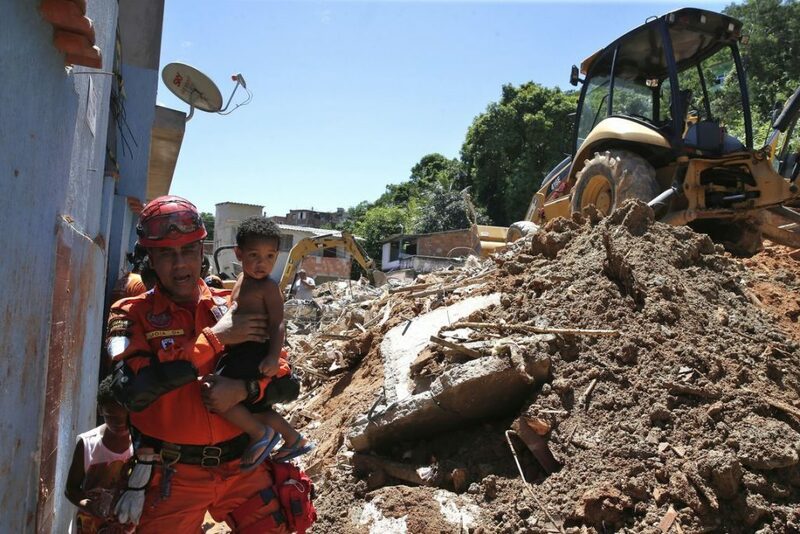 The latest victim of the deadly mudslide at Morro Da Boa Esperança in Niterói was a three-year-old boy who succumbed to injuries at the hospital on Sunday. RIO DE JANEIRO, BRAZIL – The death toll from Saturday’s (November 10th) tragic mudslide that engulfed a group of houses at Morro Da Boa Esperança in Niterói has risen to fifteen. The latest victim, a three-year-old boy, succumbed to cardiac arrest at the Azevedo Lima hospital on Sunday (November 11th), according to government officials. Firefighters and volunteers worked feverishly throughout the day on Saturday to rescue survivors following the massive mudslide in Niterói, photo by Tânia Rêgo/Agência Brasil. The boy was one of eleven people who was rescued after being buried alive from a massive mudslide that occurred early Saturday (November 10th) in the small neighborhood in Niterói, about an hour from Rio de Janeiro. The mudslide destroyed ten houses and a pizzaria. Firefighters and volunteers worked frantically for over fifteen hours on Saturday pulling out survivors buried in the rubble. Officials confirmed that the mudslide killed fourteen people, with rescue workers able to save eleven. The deadly mudslide occurred after several days of heavy downpours throughout the area which caused government officials to advise residents to seek safer ground. However, at a press conference on Sunday, Niterói’s mayor, Rodrigo Neves, attempted to exempt the city from responsibility indicating that the tragic occurrence was unexpected, despite the heavy rain in the days leading up to the mudslide. “In 2012, there was a study of ​​risks in the area and none of them indicated this was a high risk area,” explained the mayor, who also revealed that Niterói uses a system of sirens that are activated during heavy rain to alert residents of potential mudslides. “Warning sirens have been operating in Niterói since 2013, and this community did not even have them because it was not a high risk area,” he claimed.